If there’s one trend we’ve seen over the past few months when it comes to lifestyle tech products, it’s hands-down fitness and health tracking gadgets. 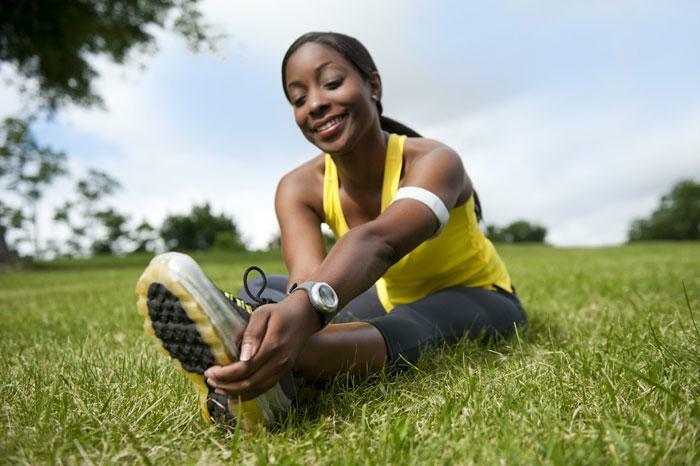 Everyone is trying to come up with the best, most accurate, and yet easy-to-wear health and fitness gadget, and there is more than a handful of contenders. While I haven’t had a chance to check out all the gadgets yet, I did manage to get ahold of the BodyMedia Core Armband ($179) powered by IBM technology for some hands-on testing. Now I can give you the rundown on what I liked, what I didn’t like, and whether it’s worth buying. First let’s look at the basics on exactly what the BodyMedia Core Armband is and how it works. As the name would suggest, the main component of the system is the armband. This lightweight band has a small device with sensors on it and a stretchy strap that lets you wear the device around your upper arm. The armband uses four different types of sensors (galvanic skin response, skin temperature, heat flux, 3-axis accelerometer) to collect over 5,000 data points each minute, helping to accurately (to 90%) calculate the amount of calories you are burning throughout your day. The idea behind the armband is that health, fitness, and weight-loss plans can fail if you don’t know exactly how many calories you are consuming and burning. By tracking calorie burn with the utmost accuracy and offering users a way to log their calorie intake, BodyMedia, with support from fitness guru Jillian Michaels, believes that it can help people have more success. The combination of sensors tracks calories burned and will even put your physical activity into different categories based on energy exerted. The armband is paired with an online dashboard application, a mobile app, and an optional display. The armband is meant to be worn throughout the day, and users can plug into their computers at night to see how they did that day. There were a lot of things that I liked about the armband in testing. Most notably, I found it very comfortable to wear. The armband is soft and stretchy and the device itself is small enough that it doesn’t weight the armband down, making it slip or drag down. It’s comfortable, easy to adjust, and can be worn under many different types of clothing if you want to wear it all day. The online dashboard is also very well-designed and is visual and easy-to-digest. Once you plug the device into your computer, you can quickly see your day’s stats measured up against the parameters that you’ve set as goals, like caloric intake, calories burned, steps, and physical activity. The set-up and use of the device was also very simple. I had to create an account and download a small piece of software that would do the syncing work for us when we plugged our armband in. Once you’ve done that, all you have to do is press the small button on the armband once you are wearing it, and within a few minutes you’ll hear a few audible beeps letting you know that the armband is now collecting data. It’s as easy as that. 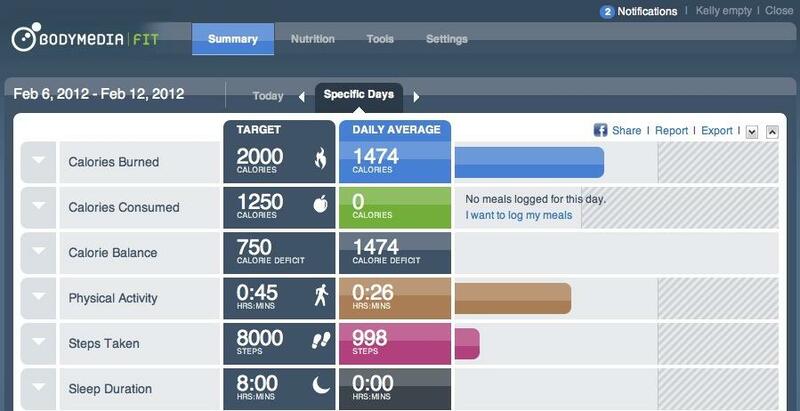 Then you can go about your day as usual and log your meals on the computer or via the BodyMedia Fit app. And this is where the dislikes come in. The first complaint about the Core armband is that you have to physically plug it into your computer via USB every day or night when you want to see your results. Maybe I’m just lazy, but that kind of kills it for us. The syncing itself is fast and simple, but having to keep track of a specific USB cord and physically plug it in every night is a little bit of a pain. Unless you purchase the extra display piece, you also won’t know how many calories you’ve burned until you sync the device to your computer. This poses a problem because the amount of calories you burn directly relates to how many calories you should consume that day. If you don’t have a way of knowing how many calories you’ve burned, it turns into a guessing game until you can go home and plug in your device. Luckily, the BodyMedia Link armband does incorporate Bluetooth technology, meaning that you could see real-time results via the mobile app or on your computer. But with the Core armband, you’re stuck either waiting until the end of the day, plugging in multiple times a day, or purchasing the extra display piece. I was not very impressed by the nutrition-tracking piece of the system either. The idea of having the health tracking and food tracking in one system is great, but it needs to be expanded. I went to add a brand of greek yogurt to my nutrition log on the mobile app, but when I searched for “greek yogurt,” only one brand and type showed up. This happened with many different foods, meaning that I would have to manually input the info for foods rather often. The app would be much improved if it had a larger food catalog (like the MyFitnessPal app) and included a barcode scanner to quickly add packaged foods. It is also not as easy as we would like to see how many calories you burned during a specific period of physical exercise. There were a few days where I did not want to wear the armband all day, but I did want to wear it during my workout to get an accurate picture of how many calories I had burned. Because the dashboard application gives you credit for the calories you naturally burn based on your age, gender, height, and weight, you have to go to the calorie graph and know what time you were working out to tell how many calories your actual workout period burned. The added steps I had taken were logged and the time of “physical activity” quickly showed up in the dashboard, but it focuses on the whole day’s results as opposed to a specific time period. The BodyMedia Core armband is probably not for you if you only want something to track how many calories your run burned, but if you are committed to wearing the armband consistently on a daily basis, it could help you get accurate information and therefore, results. I was impressed with the design of the armband and the number and type of sensors used definitely make me think that this is probably one of the more accurate trackers out there, although there wasn’t any scientific way to put it to the test. If you’re willing to wear the armband consistently and put in a little extra effort to track your food within the BodyMedia system, it could be a great tool to jumpstart weight-loss and learn more about your own health. I’m inclined to recommend purchasing the BodyMedia Link armband ($199) instead since it eliminates the plug-in headache with Bluetooth technology. Despite a few downsides, the tracking of the Core armband is impressive and I’m excited to see what the company adds to its system next.